Superb Liz, complete with shadow, only you could do this! She looks like she’s wearing a bustle. What an elegant photograph. Great minimalist photo and rule of thirds photo, too. Really nice, Liz. And thanks for your generous photography lessons in your posts. Superb Liz! One of my faves for the challenge so far. Love this. That uncluttered background, shadow, etc. Doesn’t get any better. This is perfect. I had an image in mind quite similar in style (but not subject) but it is on my home computer so couldn’t use it. Hopefully there will be another opportunity. How very sweet Liz, love it! Terrific shot, Liz, and perfect for the challenge. Love your ballerina reference. Did you ever see Walt Disney’s Fantasia? Worth the effort if you haven’t. Ostriches dancing to Ponchielli’s The Hours. Love this comment, although Must admit I’ve not seen Fantasia, but the idea of it appeals. Now you’ve sparked a vision of Swan lake and the Pas de quatre… Long legged ostriches kicking up the cygnet scene … Can’t help smiling! Love this photo and the facts you included. 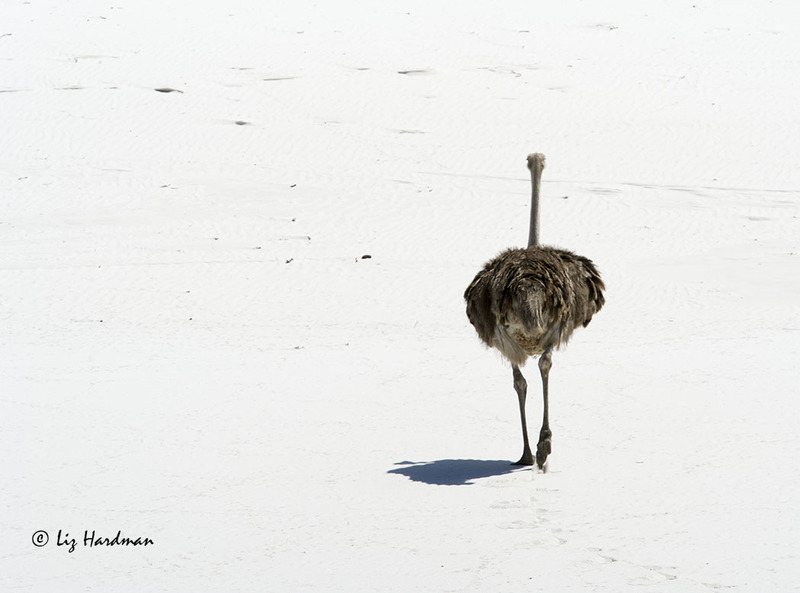 The idea of observing an ostrich on a stretch of beach never would have occurred to me. I thought they were desert birds for some reason. I so agree. Minimalist like a poster: The importance conveyed in an instant. Great shot.